Based on the true story of a pioneering woman who lived as a man, this riveting title showcases the best and the worst of America. A skillful blend of fact and fiction, Karen Kondazian’s incredible story of a courageous nineteenth-century heroine dramatizes actual events in the life of Charlotte “Charley” Parkhurst (1812-1879), a stagecoach driver for Wells Fargo. The Whip explores the tragic and, for the time, unorthodox life of a woman who chose to live as a man. Charley even voted in the 1868 American election before women were allowed at the polls. After suffering a series of devastating losses in her younger years, including the murder of her African American lover, who was a runaway slave, and a daughter, Parkhurst went on to succeed in a profession that those of her own gender could not pursue. Mistreated as a child, yet remarkably resilient, she learned a trade based on her abilities and interests rather than succumbing to role-oriented playacting. True to herself, she identified with male-dominated activities, so she dressed as a man and learned to project a male image so convincing, her colleagues didn’t question it. This researched work flows naturally, incorporating historical detail without detracting from the story. True-to-life description and a meticulous depiction of Parkhurst bring this gritty period to a degree of vividness rarely seen. The cinematic style utilizes all the senses; the world in which she survived unimaginable tragedy can be felt as well as seen in the mind’s eye. Witty dialogue, along with an intentional focus on reality, as opposed to excessive dramatization of the Wild West, make this book appropriate for an academic environment, not just mainstream entertainment. Kondazian’s fascinating portrayal of this admirable historical figure delves into the complex character of a tough woman combating old-school tradition and unhealthy stereotypes. In comparison, the twenty-first century is paradise for people who have shucked the outer shell to reach their inner potential. Parkhurst may have pursued her livelihood out of necessity, yet she rejected other options, most of which would have involved conforming to an undesirable situation, before she settled on what nineteenth-century America would have perceived as a masquerade rather than androgynous self-expression. Kondazian is a journalist and actress. 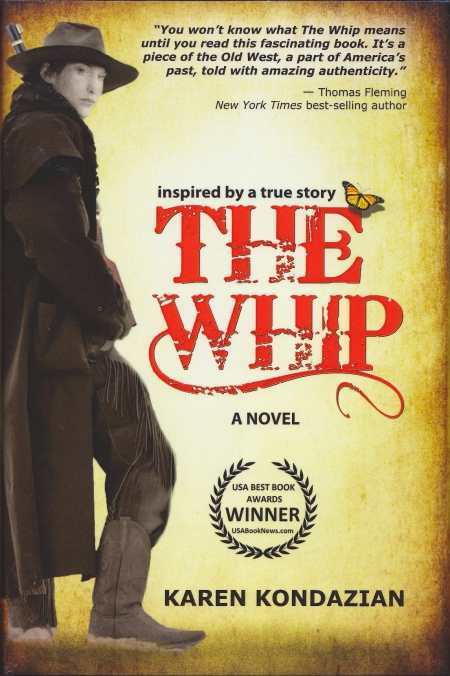 The Whip is her fiction debut. Slick packaging will enhance sales; an attractive cover depicts a woman dressed in male western garb suitable for travel. Riveting and action propelled, this award-winning title showcases the best and the worst of America as our country began to transition into a progressive society founded on fairness and equality rather than oppression and discrimination.